Oh what a treat in the mail today. I thought I would share with you my invitation to the Artisan Award dinner that I will attend during convention. Okay….I love this card. Simple but THE MOST ELEGANT style. And check out the images. This is definitely a must have and I will be recreating this invite for sure. Hope you have a wonderful Monday and thanks for stopping by. Yes, it’s Friday! I woke up this morning thinking it was Thursday…lol. I have been so disorganized and thrown off my normal routine all due to a dentist appointment yesterday. Man, that gets me so worked up and it went so smoothly without pain:) Now I can focus on getting back to stamping. Here is what I quickly came up with this morning for Taylors cupcake challenge. I wish I had more time to play with this sketch and give you more of a wow factor, so I posted a “masking maniac” creation below it with the same set (was going to submit it to the stamping royalty contest but I, once again, had other things get in the way and I wasn’t able to send it in. I had some other ideas and maybe I’ll get to that later this weekend. I added two little cupcakes to go with the cupcake theme. Remember, you don’t have to use cupcake images to participate in the challenges. Give it a try with whatever you have. Believe me…I have very little cupcake images and I’m now on the lookout for some cute ones. And this weeks featured cupcake sampler is the most fabulous Sharon Harnist (yippeee). You can check out her creation at her blog paperfections. HERE IS THE CARD I MENTIONED ABOVE. DO YOU HAVE THE PATIENCE FOR MASKING WITH 4 DIFFERENT SETS TO CREATE A SCENE??? 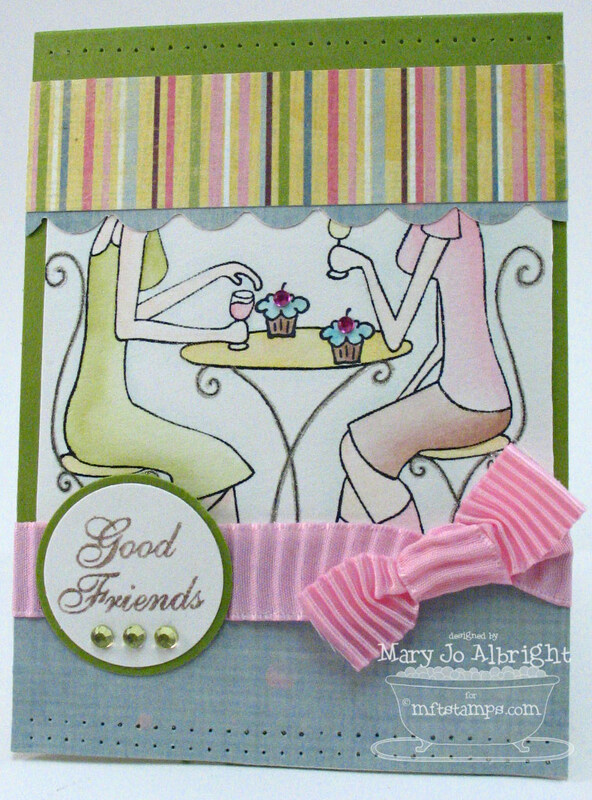 Let’s just say it took a whole weekend of on and off stamping to create this card..lol That’s right! 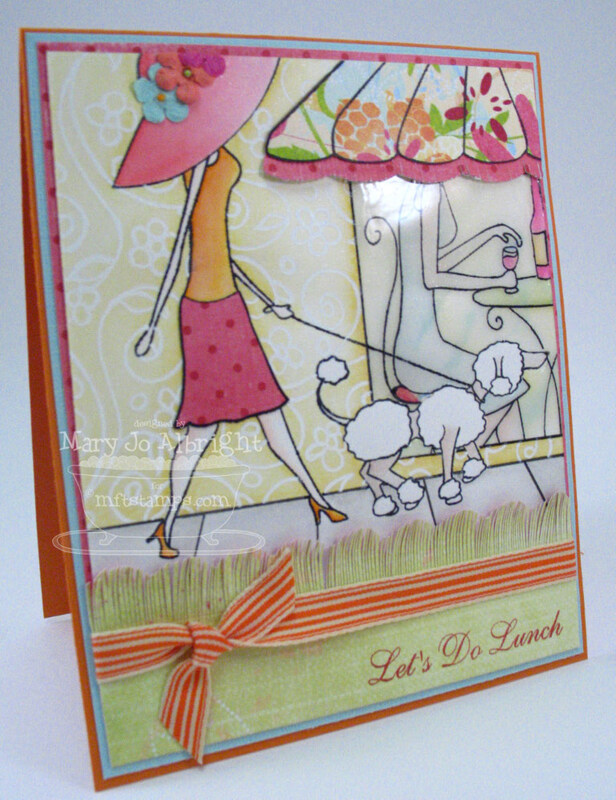 4 stamp sets: MFT’s Meet me at the Cafe (cafe window scene), Can Ya Dit It (hat), Gone to the Dogs(lady walking dog), and Behind the Scenes (floral design on wall). The window is covered with Crystal Effects with a touch of Adirondack Aqua Re-inker for the glare effect. Hope you all have a happy Thursday Friday! What to do with these $1 tins I found at Target?? Not wanting to do the exact same thing as Lauren, I had to find a way to utilize this tin. 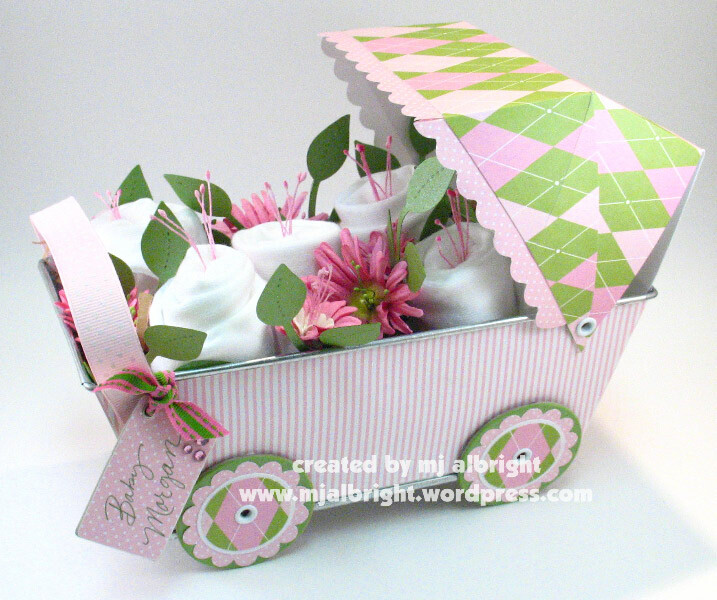 I had one of those moments while driving….how about trying to make a baby carriage? I am so pleased with the way this project turned out. I had to take a step back when I was finished and decide if I wanted to give it away..lol. Rolled the onesies, added some Prima flowers, created leaves with a Sizzix Diecut and Machine. 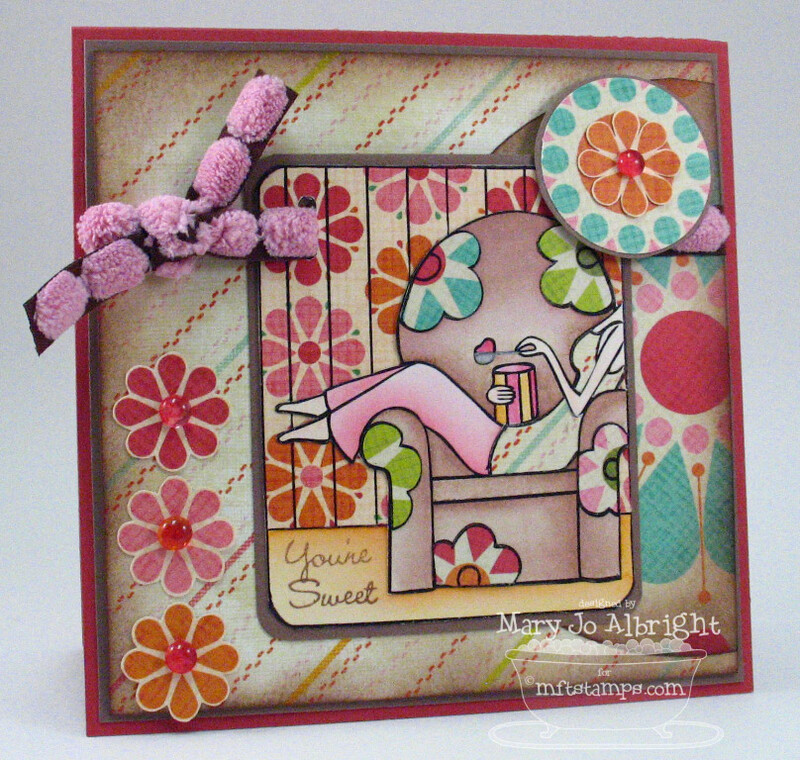 I used MFT stamp set Congrats all Around for the Onesie Cards because she’ll need to have some cards on hand post-delivery for thank you’s or announcements if she wishes. 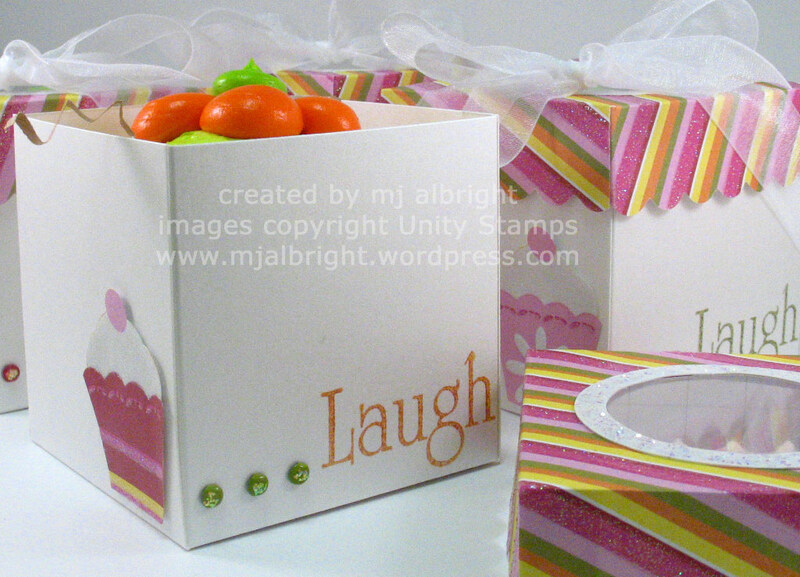 The card package contains 10 cards and envelopes with coordinating patterned paper belly band around the envelopes. 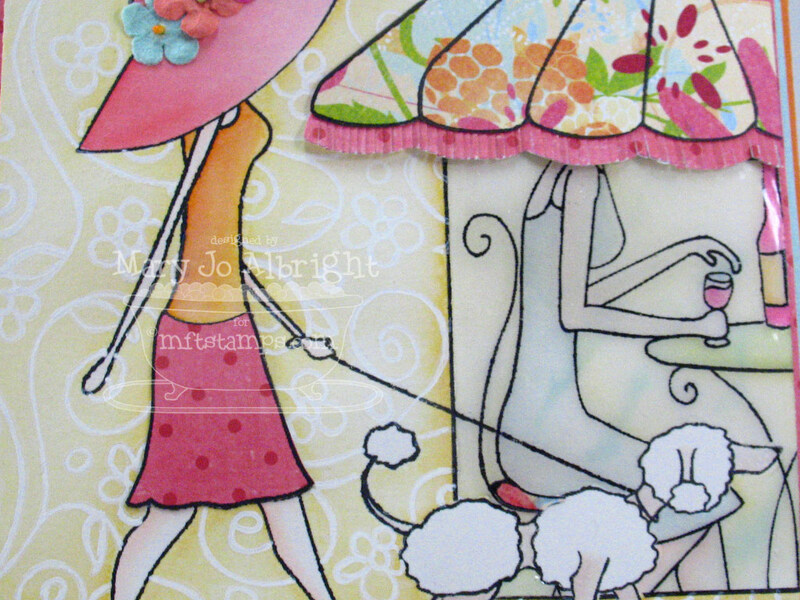 Ribbon is May Arts to continue the theme from the carriage to the card package. Today, we will be celebrating my daughter’s 14th birthday. For a teen, colorful and fun comes to mind. Lauren Meader has a challenge posted –>here<– on her blog and I thought I would give it a try this weekend. 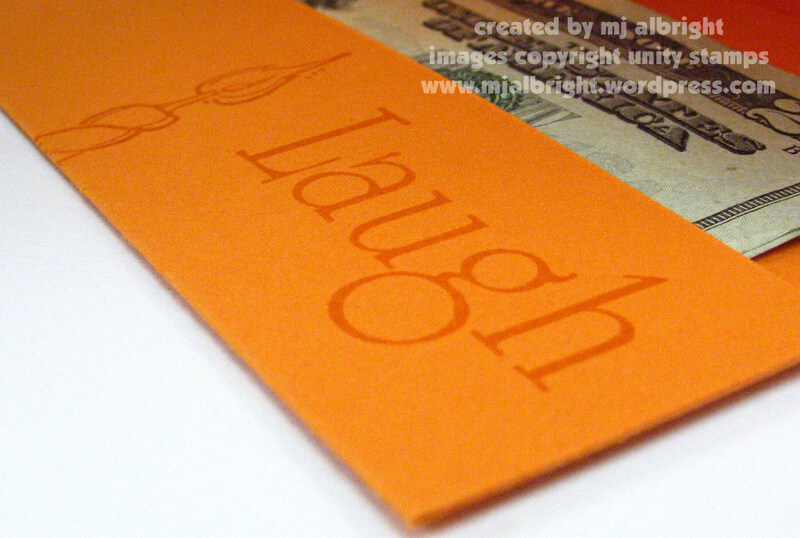 The challenge is to use part of a stamped image. 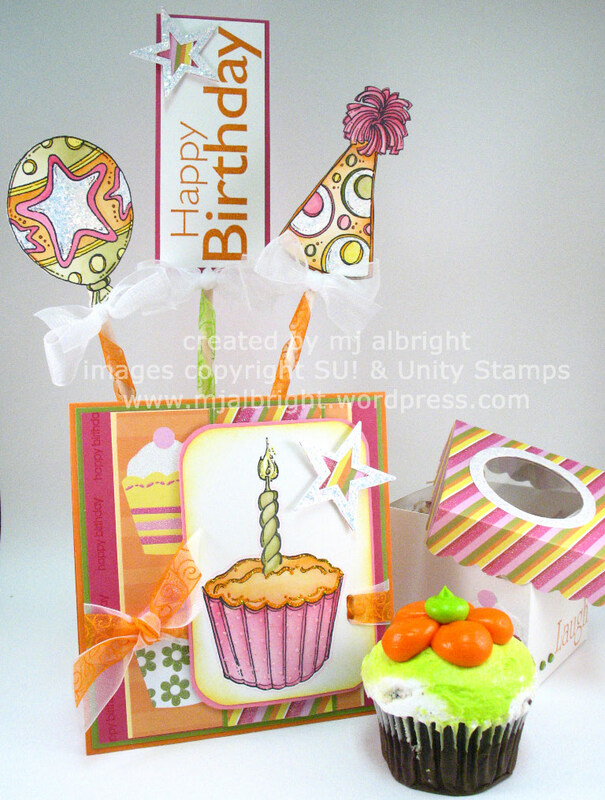 I used Unity Stamp Co. Confetti Birthday set for the challenge. With the rather large birthday sentiment, omitting parts of images worked well for this card (or the card would be a crazy 10″ long). For the inside, I created a little pocket to hold some cash. I continued the theme to the inside and only stamped the candle from the cupcake with another simple sentiment. Hope you are all enjoying your weekend. Thanks for stopping by. Hmmmmm, I think the words that come to mind are funky, groovy, 8-tracks, and throw the peace symbol in there as well. Just a little before my time, but I think the card I made for Taylor’s challenge is more of a flashback friday creation…lol It’s a busy one, but I wanted to make a bright & fun card. Remember, you don’t have to use cupcake images to participate in the challenges. Doesn’t that PP used for the wallpaper shout out 60’s? And the ribbon…I had to use this oh so soft and funky May Arts ribbon. I had a lot of fun creating this card. Now, if only I could find the opportunity to plop myself in a chair and gobble down some ice cream. 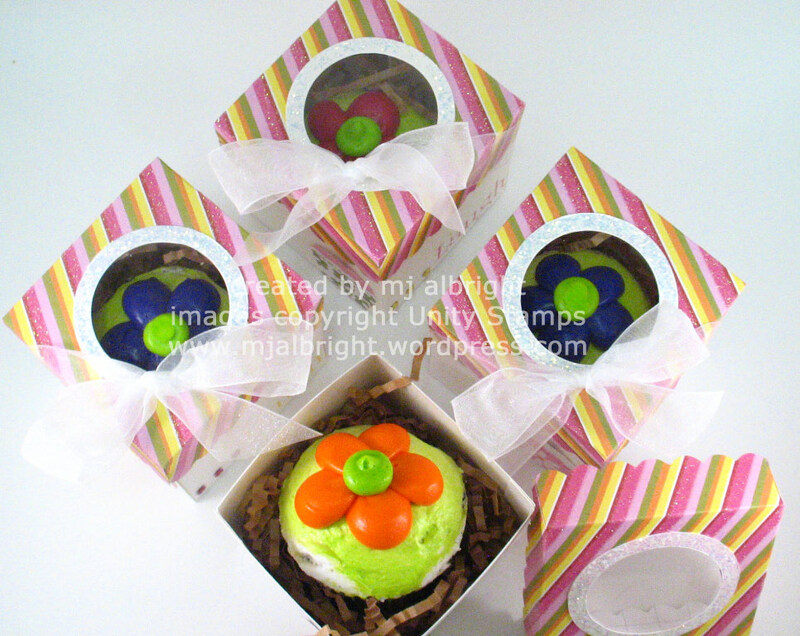 This weeks featured cupcake sampler is Tammy from Stamp Happy. Make sure to check out her creation as well. STAMPS: MFT Here’s the scoop. CS: Shimmery White, Close to Cocoa, and Ruby Red. PP: My Mind’s Eye Day Dream Funky Flowers, Candy Stripe, and In Bloom. INKS: Stazon Jet Black, Pumpkin Pie, Close to Cocoa, Ruby Red, Regal Rose, and Blush Blossom. ACCESSORIES: Dew Drops, May Arts Ribbon, Horizontal Slot Punch, 1-1/4″ & 1-3/8″ Circle Punches, Coluzzle, 3/16″ Corner Rounder Punch. TGIF!!! I’m looking forward to a weekend of relaxation and family time. I seem to be so busy lately and only have time to post on Fridays. Believe me…that doesn’t mean I’m not stamping. Busy with design team stuff that you’ll have to wait and see for now:) Will share in the future. Very little stamping (only a sentiment). 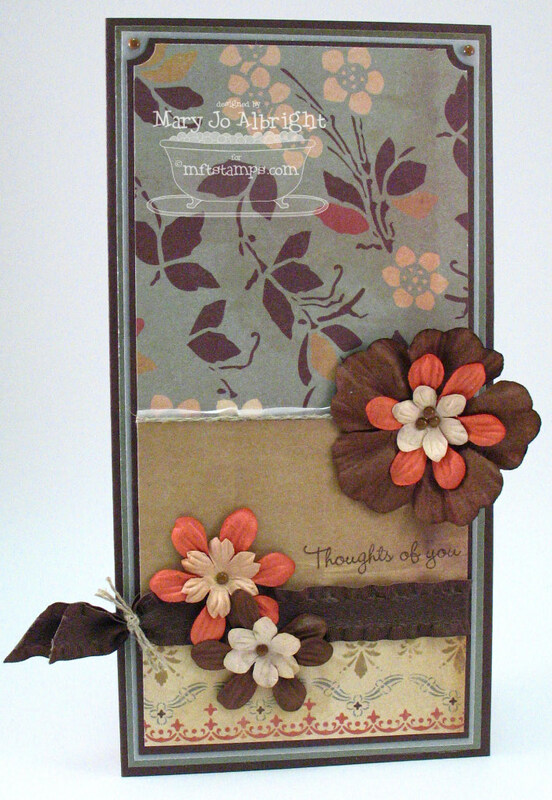 Truth be told…I just had to use the patterned paper that I fell in love with from Cosmo Cricket. Just a card to have on hand for any occassion. Make sure to stop back shortly for a funkedelic flashback creation. CS: SU! Chocolate Chip and Vellum. Cosmo Cricket Gretel: Autumn & Woodland PP. 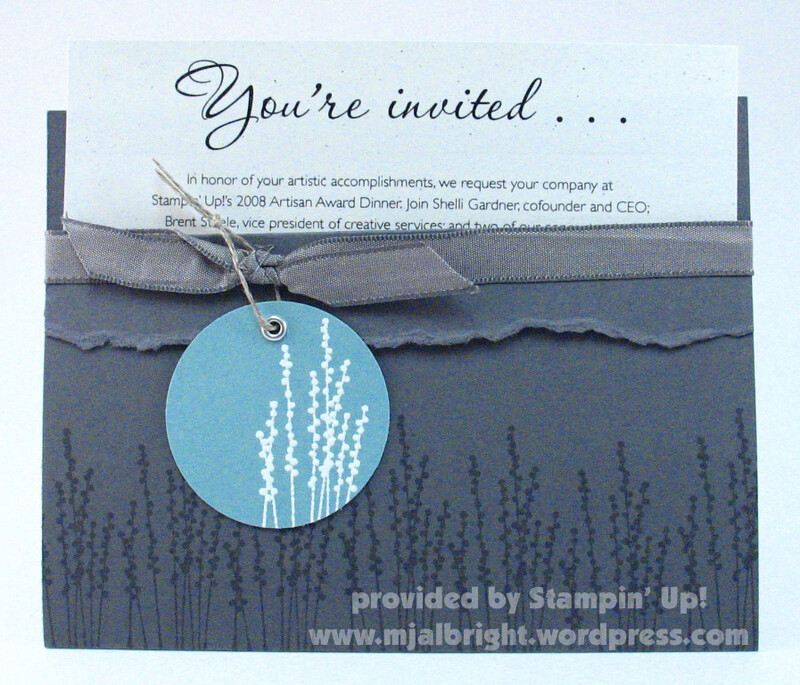 ACCESSORIES: Mini Brads, May Arts Ribbon, linen thread, ticket corner punch. That’s right! Yesterday was Taylor’s big “26th” Birthday. Hmmmmm, how about a virtual party for Taylor by her Cupcake Challenge sketch team. 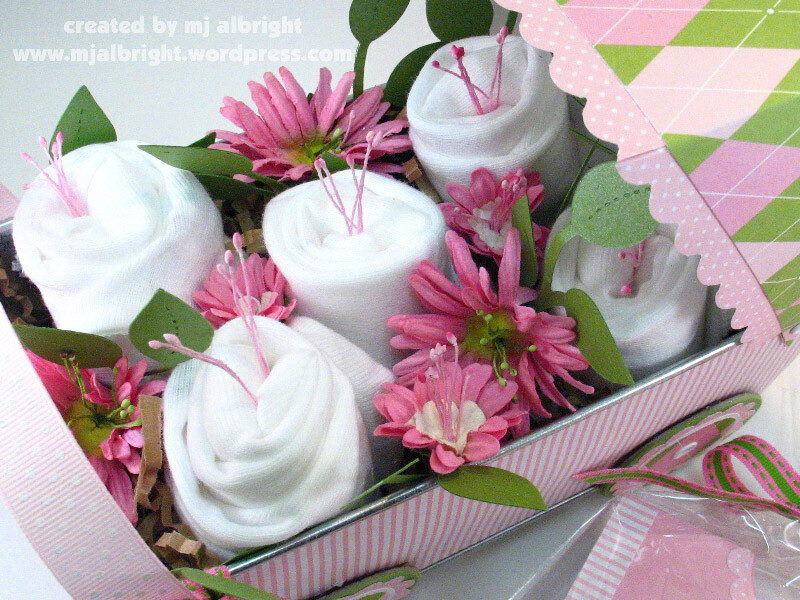 Make sure you hop on over to the blogs listed below to get a glimpse at other party goodies especially for her. Yummy! 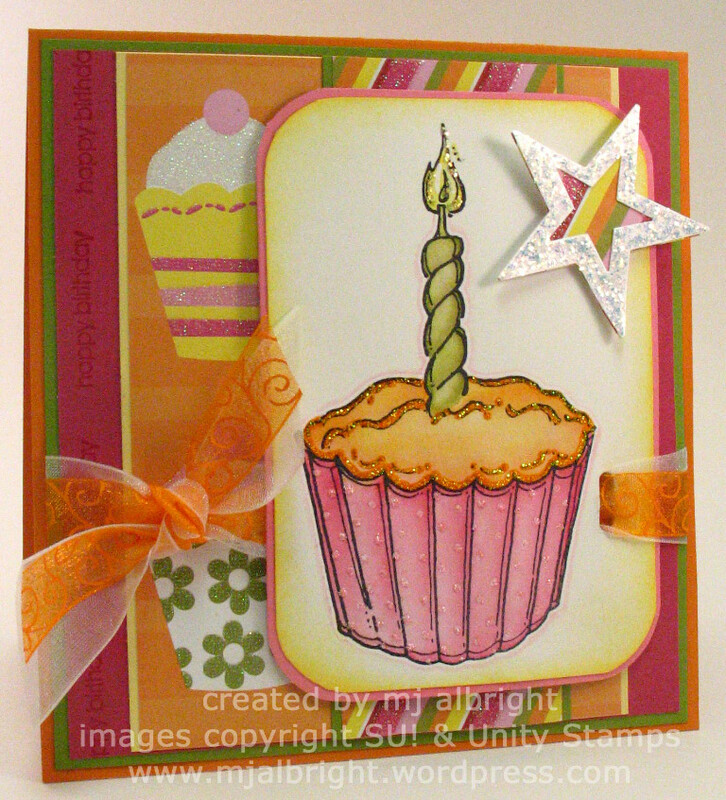 This cupcake image is from Unity Stamp Co. 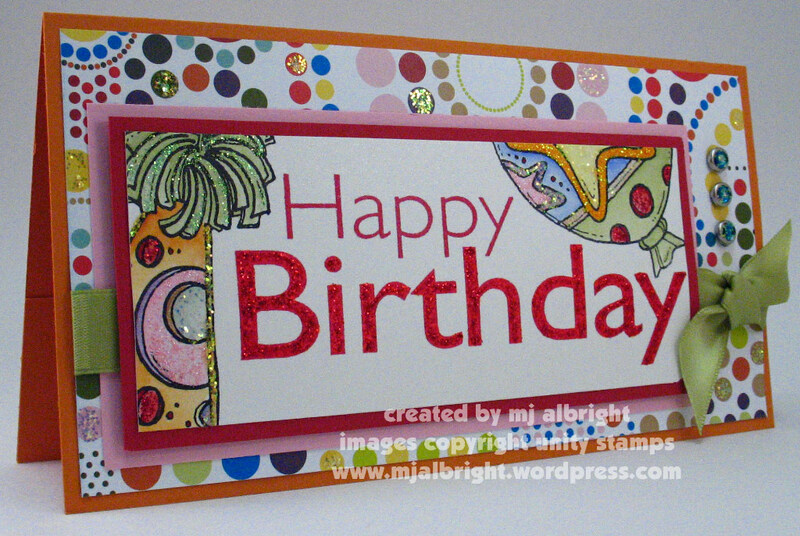 The set is called Confetti Birthday….cute large images that are fun to color in:) The happy birthday sentiment running vertically on the left is from SU! Bitty Birthday set. Lots of Stickles for fun! Birds eye view to show you the Acetate windows and those yummy cupcakes that I had to hide from my children until I completed these boxes. 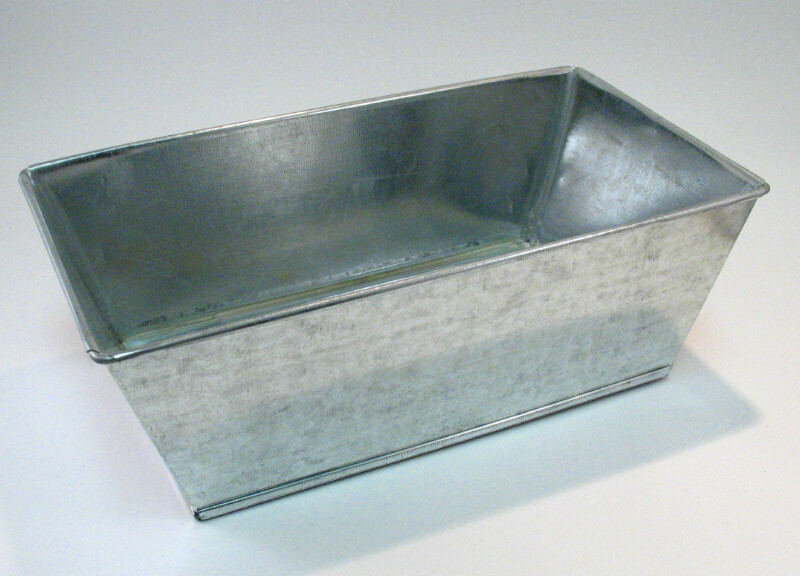 Side view of the boxes. The cupcake images were cut out from the patterned paper I used. Yep, the cupcake in this pic shows you just how tempting a pretty cupcake can be to a 4 year old little boy….lick marks! Last weeks cupcake challenge winner was Laurie Schmidlin @ Just Give Me Stamps (yeah!!! 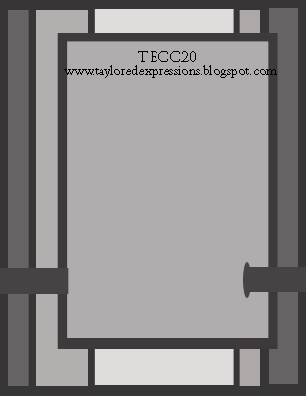 I love her style)…make sure to check out her creation for tecc20 as well! CS: Petallics Beargrass; SU! Old Olive, Pumpkin Pie, Regal Rose, Rose Red, and Barely Banana. INKS: Stazon Jet Black; SU! same as CS plus Summer Sun; Sakura White Gel Pen. ACCESSORIES: Stickles Cotton Candy, Orange Peel, and Icicle; Coluzzle Cutting System; Scor-Pal; Creative Impressions Orang and Lime Swirl Organdy Ribbon; White Organdy Ribbon; SU! Punches Star, Large Star, 3/16″ Corner Rounder Punch, Horizontal Slot Punch; Large Corner Rounder Punch; SU! Colored Brads Rich Regals, Soft Subtles, and Earth Elements; Wooden rods. Happy Birthday Taylor! I hope you had a fun-filled wonderful day.